This edition of MRM's Daily Bite features First Table, Cintas, Cooper's Meat Market, The P.J.W. Restaurant Group, Whitsons Culinary Group, Don Lee Farms, 110 Grill Restaurant Group, Sodexo, Elavon Becks Prime and Wolverine Packing. Approximately 40 percent of all food produced in the U.S. annually is wasted and ends up in landfills. With Stop Food Waste Day on April 27, Cintas Corporation announced its support for Green Umbrella’s food waste reduction campaign. Green Umbrella, an alliance of for profit, non-profit and government organizations across 10 counties in Ohio, Kentucky and Indiana, is aiming to cut landfill waste 33 percent by 2020 through awareness building and engaging corporations and households on key sustainability issues. At Cintas, the food waste campaign is one part of a larger zero-waste-to-landfill certification process. Numerous Cintas distribution centers have been certified for waste reduction under the TRUE (Total Resource Use and Efficiency) system. By sharing sustainability strategies with its locations nationwide, Cintas aims to improve how waste streams are managed in the workplace and help its employee partners rethink waste generation at home. Green Umbrella’s Waste Reduction Action Team (WRAT) is focusing on strategies for food waste prevention, like meal planning to purchase only necessary ingredients; recovery, such as donations of excess food to pantries and soup kitchens; and recycling, like composting or anaerobic digestion. For example, the WRAT is hosting lunch and learns, developing a food waste challenge for households and promoting share tables at schools and donations of leftover pre-packaged food at the end of lunch periods to support food insecure. Additionally, Green Umbrella is partnering with the Save the Food campaign, which provides resources for reducing food waste. Whitsons Culinary Group®, a provider of nutrition services for public schools throughout the Northeast, has announced the launch of the Meatless Monday health initiative in all school districts Whitsons services. Meatless Monday is a global campaign that encourages students to enjoy meat-free meals on Mondays. Studies have shown that increasing plant-based proteins in your diet may reduce the risk of chronic preventable conditions such as cancer, cardiovascular disease, diabetes, and obesity. Choosing to go plant-based, even one day a week, can also help reduce our carbon footprint and save precious resources like fossil fuels and fresh water. “Whitsons is proud to be a part of the Meatless Monday campaign. 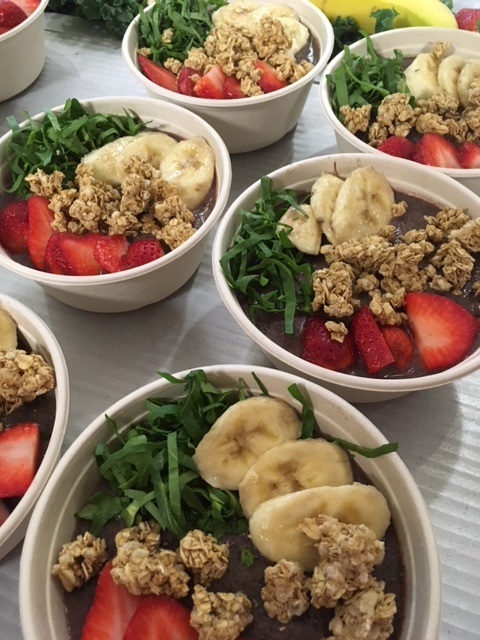 It perfectly complements our Simply Rooted™ philosophy of promoting healthy foods, a healthy environment, and balanced diets,” said Kelly Friend, Chief Operating Officer of Whitsons. “We are not taking away the option of meat on Mondays, we are simply making sure we are featuring and promoting a student-friendly vegetarian option. When students are looking for something hearty like a burger, we encourage them to try vegetarian burger options such as our classic garden or black bean burger. We prepare them just like we would a traditional burger and offer a variety of healthy toppings to keep it interesting,” said Friend. In recent customer surveys conducted by Whitsons, students expressed an interest in having more meatless, plant-based menu options such as vegetarian and vegan which has been a growing trend with Generation Z. More students prefer replacing animal products with plant-based alternatives. "Our collaboration with Whitsons School Nutrition will provide students and staff in over 95 school districts in the Northeast with delicious meatless options every Monday throughout the school year. We hope the implementation of Meatless Monday in schools with Whitsons dining services will inspire students to start each week taking small steps that can instill healthy habits for life," said Cherry Dumaual, Partnerships Director at The Monday Campaigns. 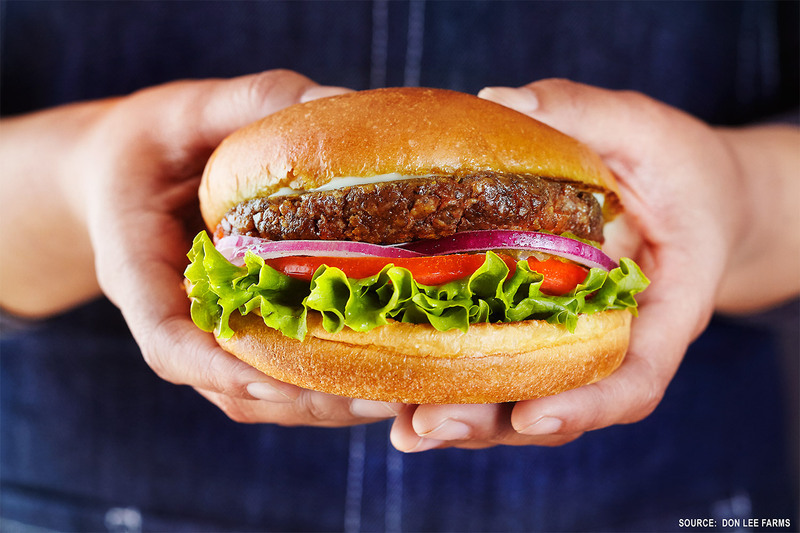 Don Lee Farms has sold more than a million Organic Plant-Based Burgers in less than sixty days, becoming the fastest growing product in its category. The Don Lee Farms’ burger “bleeds” organic beet juice and sizzles on the grill from organic vegetable-based fats just like raw beef. It is the only burger in its category to qualify for the Organic Seal certified by USDA. The new burger launched to rave reviews. CookingLight Magazine proclaimed, “This burger was really delicious. I’d buy these again,” after tasting the top three leading brands. Read more of the Daily Bite at ModernRestaurantManagement.com.